Another beautiful bottling from one of Scotland’s oldest distilleries, Bowmore on the Isle of Islay. This bottling is named “Golden and Elegant”, a reference to the colour and flavours of the single malt. The whisky was originally produced for the travel retail market, and was first launched in 2017. 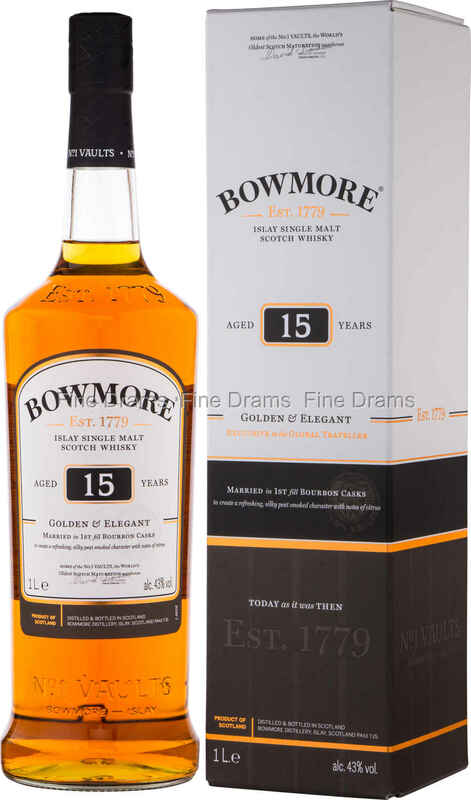 Aged for 15 years, this whisky pairs the vanilla rich and sweet flavours of first fill former Bourbon American oak casks, with the powerful peat reek for which Bowmore is well known. Drinkers should expect additional, slightly floral aromas, and hints of toasted nuts. This whisky is bottled 43% ABV, giving the flavours a slight boost. This is a big one litre bottling, offering superb flavour for money.